The Thermo Revco Chromatography Refrigerator is as precise as it is spacious and is built to meet your needs for a variety of industrial, clinical and scientific applications. This 51.1 cu foot lab refrigerator comes complete with two hinge-covered 2in access ports and a duplex vapor proof outlet, that can accommodate chromatography instruments for easy set up and access. The temperature range of this large capacity chromatography refrigerator is adjustable between 1°C and 8°C and can be set at the digital control panel. This lab refrigerator is microprocessor controlled, with simple operation and programing, an icon based interface, and key lockable set points to prevent accidental tampering. This chromatography refrigerator comes with a variety of alerts to protect the contents, such as a graphic thermometer display that flashes at the top for over temperature warnings and at the bulb to under temperature warnings and as alerts for power failures. The Thermo Revco Chromatography Refrigerator is constructed of cold rolled steel both inside and out with a corrosion resistant high impact powder coat. 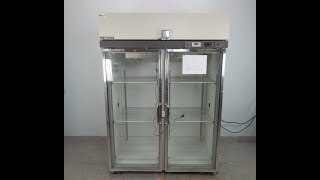 The double multipaned glass doors of this chromatography refrigerator are lockable and will hold when open to 90°. Condensation in this chromatography fridge is automatically removed and an automatic defrost eliminates the need for a timer, minimizes build up and optimizes efficiency. Lastly the excellent uniformity you expect from a Thermo Revco Lab Refrigerator is handled through positive forced air circulation, and industrial quality, extra strength compressors filled with CFC free refrigerant. 57 x 38 x 78 in. This Thermo Revco High-Performance Chromatography Refrigerator has been tested for functionality and comes with current validation reports. All of our lab equipment comes backed with our standard warranty. Should you have any questions, please don't hesitate to contact us.